congratulations to the mystery buyer… To bad his bid was too high for me otherwise I would be the lucky winner of this silent auction. 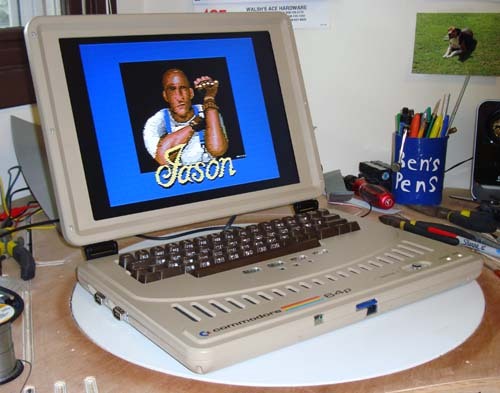 I hope this unique c64 laptop will get a good home. I’ll just cross my fingers that someone REALLY liked this particular charity, and didn’t actually want the laptop that bad. You should just auction ALL your stuff Ben. I can’t imagine you sold the first one of these for six thousand dollars. That has to feel good – something you built with your hands fetched that high of a price and it benefited an awesome charity. Blown away by the price it fetched – that it went to a worthy cause is icing on the cake. You know what I’m thinking? SNES and Genesis laptops! Oh well… here we go… podcast? This was a cool looking unit, and maybe enough inspiration for me to design something similar. Would love to see it with everything there plus implementation of a real IEC port to hook up a printer/disc drive. That would be perfect. It did support real carts right? I’d stick some kind of disc accelerator on that baby. I have one thats still in plastic, in the box, with all paperwork, and programs……real cool looking unit!! Open to offers……..pics alaivablle upon request.